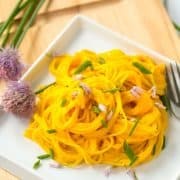 A unique twist on pesto, this beautiful orange carrot pesto is a perfect quick and easy pasta dish. Serve up some grilled chicken with it for a perfect complete meal! I’ve reviewed Heather’s first book over three years ago. It is titled Heather Christo’s Generous Table…and we still make the chive bread often. Since Heather’s first book came out, her life has changed dramatically. Her daughter Pia was five when she ended up in the ER with severe abdominal pains and dry heaving. Unsatisfied with the answers from physicians they saw, Heather went into momma bear mode and followed her gut — the instinctive feeling she had that this could be related to food sensitivities or allergies. 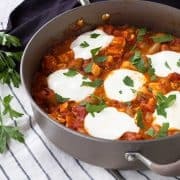 Through a combination of food diaries, elimination diets, food allergy testing, and doctors visits, she not only determined that Pia was experiencing food allergies, but so was she, as well as her other daughter. They went cold turkey and eliminated all the foods on their lists. This was not a small task. The entire family became gluten, dairy, egg, soy, and cane sugar free. Individual ingredients and foods were also avoided based on the results of each person’s test results. As a mom who had her own wake-up call when N ended up in the ER two years ago, Heather’s new book, Pure Delicious, speaks right to my heart. Although we may not share allergens (N is severely allergic to sesame, and many recipes in this book include sesame or sesame oil), we do share experiences and fears. 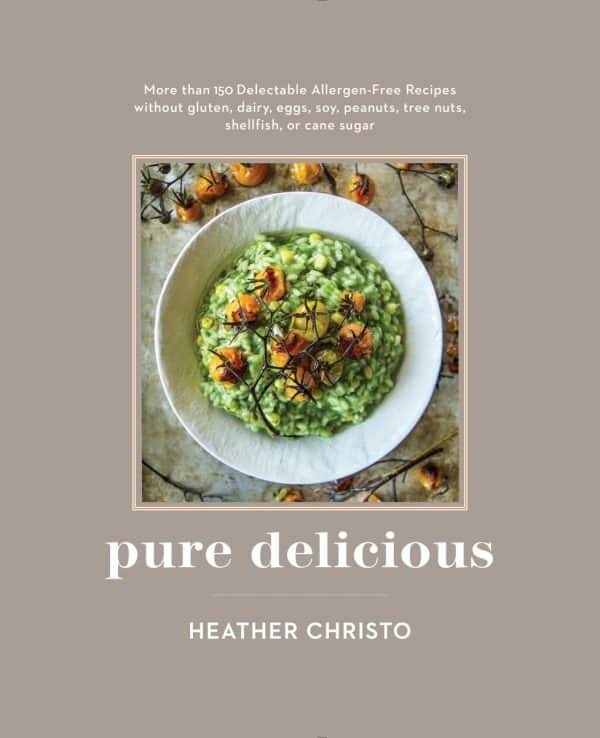 I look forward to digging further into Heather’s story – her book not only houses tons of great recipes but it also includes over 55 pages of fantastic advice not only for determining allergens but also for maintaining normalcy, school lunch prep, cooking dinner with your kids, eating out, and more. Any mom of a kid with food allergies knows how hard some of these situations can be. I’m definitely going to be putting some of Heather’s advice into use as N starts school in the fall. And basically every other recipe in the book. Still with me? I don’t think I’ve ever gone on and on so much during a book review, but as you know, food allergies are point of passion for me. 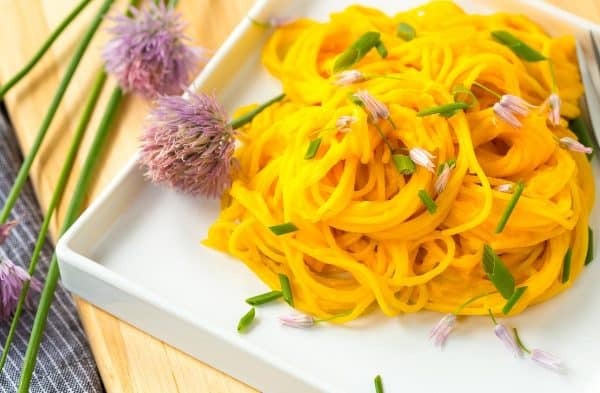 Should we talk about this gorgeous and unique carrot pesto? First of all, this is unlike any pesto you’ve ever tried before. It’s nut-free (yay!) and it’s also basil free! 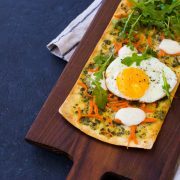 Carrots shine as the star here while the other ingredients (garlic, rice vinegar, and olive oil) play supporting roles. 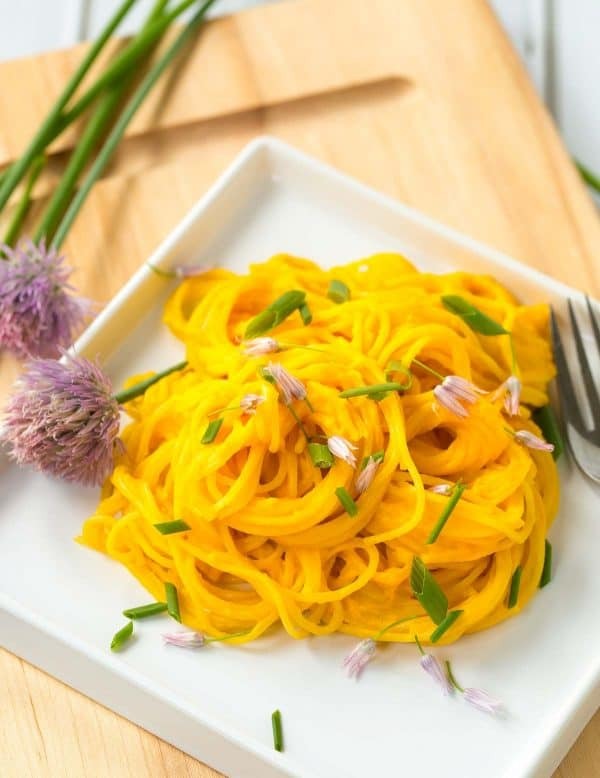 Since it’s such a simple no-frills recipe, make sure to use your best olive oil so the flavor can shine (this olive oil is one of my favorites). If you want to make this a complete meal, it would be great served with some grilled chicken. Chive flowers optional, but aren’t they pretty? Bring a large pot of salted water to a boil. Add the carrots to the pot and boil them for 10 minutes. Using a slotted spoon, remove the carrots from the water, shaking off the extra water; don’t discard the cooking water. Place the drained carrots in a blender and add the garlic, vinegar, and oil. Puree until very smooth. Season generously with salt. Bring the pot of water back to a boil and add the pasta. Cook just to al dente (a few minutes short of the manufacturer’s directions). 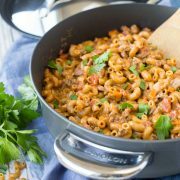 When the pasta is cooked, drain and return it to the empty pot. Add the carrot pesto and toss to coat. Transfer the past to a serving platter, garnish with edible flowers and chives, if desired, and serve hot. Verdict: I love this unique carrot pesto. Husband’s take: I don’t think he actually tried any of this. He’s kind of sensitive to garlic, so I just made a small batch of this pesto for myself. Heather’s book is so amazing right!! Before I even made anything in it a friend of mine was over, and her husband was just diagnosed with a milk allergy and they are having a sad time with it. She borrowed the book, made a recipe, and then bought one for herself because it’s so good! 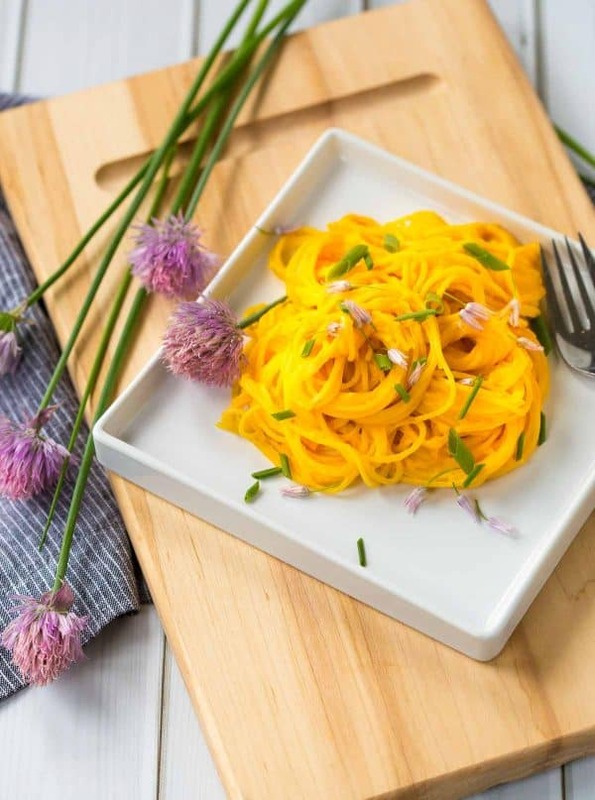 I love the looks of this carrot pesto and your photos are beautiful Rachel!